Yolande Yorke-Edgell is currently creating a new work, mentored by Robert Cohan, in conjunction with 3 films by Larry Cuba. This except is from the work that has been created so far with the film 3/78. The timing of the film has been slightly altered to allow for the dance movement to breathe within the film. There are moments when the dance reflects the movement on the screen, at at other times the movement reacts to the animation, creating a dance that brings the two art forms together to move as one. Yolande trained at Arts Educational School, Central School of Ballet and London Studio Centre. After graduating she joined Extemporary Dance Theatre. She went on to dance with Extreme Measures before joining Rambert Dance Company under the direction of Richard Alston. In 1994 she moved to Los Angeles to join the Lewitzky Dance Company where she danced many leading roles and was appointed Master Teacher by Lewitzky herself. After the closure of the Lewitzky Dance Company Yolande formed her own dance company in Los Angeles, Yorke Dance Project. She has also been a guest artists for Pacific Dance Ensemble, Post House Dance Group in addition to working as assistant director for the Los Angeles Children’s Opera. In 2001 she co-directed the play Time Out for the New York Fringe Festival. On returning to England she danced in Adam Cooper’s? production of Les Liaisons Dangereuses and Graham Vick’s production of A Midsummers Marriage with the Royal Opera. Yolande joined Richard Alston Dance Company in the summer of 2006 touring throughout the UK and the US. Whilst performing with Alston, Yolande continued to develop her own choreography with the premiere of two of her works in the Resolution! seasons at the Robin Howard Dance Theatre. She has made work for Intoto, Millenium Performing Arts and teaches contemporary dance to Royal Ballet Students at White Lodge in addition to choreographing for their annual graduation performance. 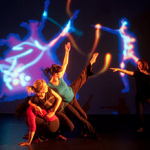 In 2009 Yolande formed Yorke Dance Project in the UK has created work for the company’s three seasons in addition to creating a specific work to commemorate 40 years of Glastonbury Festival which was performed on the “Spirit of 71” stage. 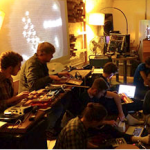 Behaviour is Bath Spa University’s live electroacoustic improvisation ensemble. This large scale electronic and digital sonic ensemble work with the full dynamic range of pin-drop fragility to occasional cascades of complex noise. Behaviour performances combine interpretations of ‘classic’ large ensemble improvisation works and truly original strategy driven compositions that respond to their rich and diverse orchestration and sound manipulations. The ensemble’s detailed sonic palette is created from a fusion of sources. Each performer offers a unique contribution, developed through explorations into ‘instrumentalising’ found and adapted objects, ‘wrong’ uses of audio technology, and extended techniques on prepared instruments. Handmade controllers for real-time laptop software environments, adapted turntables, self designed and ‘circuit bent’ electronic instruments, and live capture/manipulation of microscopic sound worlds using contact microphones and coil pick-ups all find a home in Behaviour. The project was devised in 2005 by its director Dr Andy Keep as an innovative approach to learning and teaching improvisation and performance techniques to third year students on Bath Spa University’s Creative Music Technology degree programme. Its annual innovative public concert activity has given the ensemble a national reputation. Jon Pigott is a sound artist whose work explores materials, objects and electricity through a sculptural and kinetic form. Pieces such as Unfixed Media (2011) and The Sonic Marble Run (2007) embody a spirit of technological assemblage, which seeks to expose the process of sound producing events. In 2013 his electro mechanical sensibilities have been applied in collaboration with the Behaviour ensemble, providing a live visual accompaniment of light and movement to their improvised electronic music. Jon currently holds an academic position at Cardiff School of Art and Design, prior to this he led the technical team at Peter Gabriel’s Real World Studios. Multi-award winning digital dance performance Hidden Fields is a high-impact and access-ible show constructed using the “danceroom Spectroscopy” technology, and has arisen through a unique collaboration between a research scientist, computer scientists, a composer, a choreographer, and contemporary dancers. Using rigorous methods from computational physics and state-of-the-art computing, Hidden Fields interprets dancers as fields whose movement creates ripples and waves in an invisible sea of energy. The result is a gentle piece comprised of interactive graphics and soundscapes, both of which respond in real-time to how the dancers use their movement to sculpt the invisible fields in which they are embedded. Hidden Fields offers a unique and subtle glimpse into the beauty of our everyday movements, allowing us to imagine how we interact with the hidden energy matrix and atomic world which forms the fabric of nature, but is too small for our eyes to see. It’s as much a next-generation dance piece as it is an invitation to contemplate emergence, dissipation, and the interconnected dynamism of the natural world – from the microscopic to the cosmic. Feeding You is a short-circuit in desire-production, creating a feedback loop in the image machine that operates on the body’s affective responses in order to increase the profit of capital. Its source material is the audio-visual language of branding and advertising of global corporations, which is thrown into the proverbial meat grinder to emerge in grotesquely distorted fashion. Through digital live processing the functionality of this material, the manipulation of desire, is literally turned on its head: Here, it is the material, the familiar brand logos and sound identities, that is manipulated and turned back onto itself to create a neo-psychedelic liberatory aesthetics. In this sense, Feeding You could be seen as a kind of anti-retail therapy, a form of psychological remedy that inverts the short-lived gratification that can be gained from giving in to an impulse to purchase some thing or other, and instead seeks to shock the metabolism out of the habit of consumption. We invite you to expand your total self. Moving image artist Max Hattler was educated in London at Goldsmiths and the Royal College of Art. He has had solo exhibitions at Tenderpixel Gallery, Playgrounds Festival, Lumen Eclipse, Media Art Friesland, and Someonesgarden Tokyo, and retrospectives at Go Short Nijmegen, Image Forum Festival, Fredrikstad Animation Festival, Lago Film Fest, Branchage Film Festival and International Short Film Festival Detmold, among others. His works have been shown at hundreds of film festivals as well as in museums and galleries such as Erarta Museum, MOCA Taipei, the Marl Video Art Award, Yota Space and Gasworks Gallery. Awards include Multivision Festival, St. Louis Film Festival, Premio Simona Gesmundo, Visual Music Award, Animate OPEN Digitalis, London International Animation Festival, Videofestival Bochum, Videologia and many more. 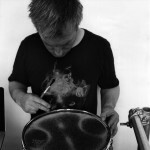 Matthias Kispert is an artist and electronic music composer and performer working in London. His work encompasses sound, video, audio-visual live performance, improvisation, installation and interventions in public space. As a member of artist collective D-Fuse, he works on the sound aspect and conceptual development of much of the group’s work. He also regularly collaborates or performs with a range of artists including Quayola, United Visual Artists, Bart Hess, Steve Beresford and Blanca Regina. His work and collaborations have been shown at MU, STRP, Sonic Acts (Netherlands), Get It Louder, HK Arts Centre, I/O Gallery (China), Moscow Architecture Biennale (Russia), LEV (Spain), USC, TriBeCa Film Festival and Eyebeam (US), Royal Festival Hall, onedotzero, AV Festival, ISEA (UK), EMAF (Germany), Itaú Cultural, FILE, Multiplicidade (Brazil), among others. Construction in Kneading is a live audiovisualisation of a Mandelbox fractal, one of several recent multi-dimensional fractals inspired by the famous Mandelbrot set. The recursion formula upon which the escape-time fractal is based is similar to that of the so-called Baker Map and resembles the actions of kneading dough in bread making. Through this relatively simple process carried out in three dimensions and controlled through the real-time manipulation of the variables, complex patterns arise from which all the audio and the visuals are generated. 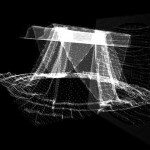 It is implemented in the programming environment Max/MSP/Jitter. The work consists of three parts. A cube of data calculated from the fractal is audiovisualised using an increasing number of dimensions in each part. In Part 1, a line or one dimension of data is used. 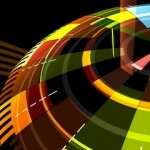 In Part 2, a slice or two dimensions of data are used. In Part 3, a cube or three dimensions of data are visible as points. It can be performed in stereo or quadraphonic audio. This set features four, short, abstract audiovisual works created as part of Lewis Sykes’ Practice as Research PhD and recent collaborative practice with Ben Lycett – all of which attempt to show a deeper connection between what is heard and what is seen by making the audible visible. By looking for similar qualities to the vibrations that generate sound in the visual domain, they try to create an amalgam of the audio and visual where there is a more literal ‘harmony’. ‘Stravinsky Rose’, is a real-time visualisation of Igor Stravinsky’s colourful and witty 3 pieces for solo clarinet as performed by Fiona Cross of Manchester Camerata. It adapts an algorithm developed by seminal computer-aided animator John Whitney Sr. to create dynamic, alternately diverging and converging, naturalistic patterns, more or less equivalent to the harmonies within the music itself. ‘Moire Modes’ is an audiovisual work that uses moire effects to visualise the vibrational modes of a perfect, virtual drum skin. ‘Whitney Triptych’ explores counterpoint between two harmonically interdependent melodies by visualising each as a unique ‘Whitney Rose’ pattern with a third, central rose displaying the harmonic relationship between them. 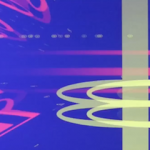 ‘Re-calculated Movements’ is a live audiovisual performance which links the sonic textures within a minimal techno soundscape directly to an abstract visualisation inspired by experimental animator Larry Cuba. The works explore real-time audiovisual performance using custom-made hardware and software systems developed by Sykes and Lycett using the creative C++ toolkit openFrameworks – which may well will include frickin’ lasers! Lewis Sykes is an artist, musician and digital media producer/curator based in Manchester, UK. A veteran bass player of the underground dub-dance scene of the 90s he performed and recorded with Emperor Sly, Original Hi-Fi and Radical Dance Faction and was a partner in Zip Dog Records. Chromophore is an audio-visual performance work that applies bi-directional communication between audio and visual systems to create colour-shape-sound modalities. Transformations of three-dimensional geometric primitives and superellipses are tightly synchronised to an electro-acoustic sound composition constructed from field-recordings. The acoustic architecture of the piece is by informed algorithmic audio analysis and audio time-line triggers. External performative midi and keyboard control is used to generate further isomorphic relationships and lyrical bindings between domains. A chromophore is the part of a molecule responsible for its color. Paul Prudence is an audio-visual performer and live-cinema artist working with computational, algorithmic and generative environments. His work, which had been shown and performed internationally, focuses on the ways in which sound, space and form can be cross-wired to create live-cinematic visual-music experiences. Paul is known for his complex time-based geometric narratives which are precisely synchronised to electroacoustic sound design and sound art compositions. Paul has given lectures and workshops on computational film making techniques to a wide range of audiences and venues – from MFA students to art-science conferences and through to digital arts festivals. He has presented his personal work and his inter-media research at venues such as The Royal Institution and The Science Museum in London, The School of Visual Arts in New York City, as well as other academic institutions internationally. 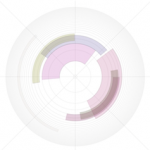 Paul maintains the research weblog Dataisnature in which he writes about the interrelationships between natural processes, computational systems and procedural-based art practices. He has authored chapters in a number of books covering visual effects and interface design using code and programming. He is a contributor to both Neural magazine and Holo magazine – both deal with media art, electronic music and computational creativity. He is a guest contributor to creativeapplications.net reporting on innovation and emerging currents at the intersection of art, media and technology. A performance in two parts. Lecture – A brief, whimsical lecture proposing that our perception of time requires that musical patterns be laid out in a line, like beads strung on a wire. The case is made that by using metaphors of higher-order spatial geometry, we can imagine a change in our perception such that the linear patterns of a piece of music appear as a shape, and by doing so, we can ‘see’ its form. 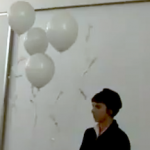 Demonstration – This theory is demonstrated with helium balloons tied together that accompany a recorded piece of music (an original vocal piece). The helium balloons are weighed down with bits of paper. Bit by bit, the paper is torn off so that the balloons hover in the middle of the room, height-wise. The gravity-defying appearance of the balloons hints at the supernatural idea of a higher-order geometric perception. The balloons (points) tied together by string (vertices) are described as a higher-order shape that we can only see in 3-D due to the limits of our perception. The balloon-object represents the form of the music that it accompanies. The Threnoscope is an audiovisual compositional system focussing on two key elements: drones and microtonality. The piece aims to remove linear time from the music by emphasising stasis or circularity. Through visual representations of harmonic relationships, tuning systems and drone states, the system affords specific compositional approach that can be performed using the method of live coding. This proposal is on an audiovisual live coding performance where the performer is on stage improvising on the audiovisual Threnoscope system through live coding; writing code in realtime that serves as notational instructions. The Threnoscope is a new compositional system that has only been used in performances four times: at Bristol’s Arnolfini; AudRey studio, London; MuseumsQuartier Vienna; and Cafe Oto, London. Thor Magnusson’s background in philosophy and electronic music informs prolific work in performance, research and teaching. His work focusses on the impact digital technologies have on musical creativity and practice, explored through software development, composition and performance. Thor’s research is underpinned by the philosophy of technology and cognitive science, exploring issues of embodiment and compositional constraints in digital musical systems. He is the co-founder of ixi audio (www.ixi-audio.net), and has developed audio software, systems of generative music composition, written computer music tutorials and created two musical live coding environments. As part of ixi, he has taught workshops in creative music coding and sound installations, and given presentations, performances and visiting lectures at diverse art institutions, conservatories, and universities internationally. Thor has presented his work and performed at various festivals and conferences, such as Transmediale, ISEA (International Symposium for Electronic Arts), Ertz, RE:New, Sonar, ICMC (International Computer Music Conference), NIME Conference (New Interfaces for Musical Expression), Impact festival, Soundwaves, Cybersonica, Ultrasound, and Pixelache. Thor Magnusson lectures in music at the Music Department of University of Sussex. 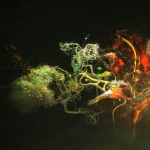 Mixed media artist Andy Thomas explores the fusion of nature and technology by taking sampling to new and unique places through the creation of organically sculpted 3D animated fluid simulations that are activated by sounds of nature. Sounds of birds, frogs and insects are digitally recorded and fed into a computer, the waveforms are then used to trigger fluid simulations created through various different types of software. Once all the animations have been rendered a custom made catalogue of motion art is then mixed live with a laptop and VJ mixing software to create a 30 minute sound art performance. The visual appearance of the sound art sculptures has been created in a way that reflects the organic nature of each natural sound that has been sampled. Colours, textures movement have all been considered. The theme of this performance is mankind’s corruption of nature. Advances in technology led us head long into an unknown world where mother nature has been molded into a form that suits our needs. Always interested in painting and drawing from a young age, Andy began his career with his involvement in Melbourne’s early rave scene back in 1993 creating UV murals for warehouse parties. His love of electronic music and all things digital lead him into the realm of computers in 1997 after finishing a graphic design course at Monash University Melbourne. In recent years he has begun to experiment with creating a visual fusion between Nature and Technology, by taking photos of plants, insects and machines and compositing them with artificially created forms in various 3D programs. His photographic endeavours have led him to such exotic locations as Borneo, Laos and the rainforests of Tasmania and the Daintree River. He has exhibited work at galleries in New York, Melbourne and an up coming exhibition at the M16 Art space Canberra. Along with art and technology festivals in Europe and North America. 2010 and 2011 has seen the beginning of the Echoes project. Through the use of digital audio software Andy has begun to experiment with creating audio life forms that react to sounds. Corrupting nature with technology, by sampling sounds of the forest and running them through various computer programs.